הנה עוד חוב ישן שביקשתם ואמרתי להמתין… אז הנה – למי שהמתין או למי שרוצה – הפתרון שלי להביא לכם את…. ה Google ChromeCast או All-New Fire TV עד הבית! חברנו שוב לחברת DealTas וביחד קבלו את העסקה הטובה ביותר שתוכלו להשיג! למי שטרם יש כתובת בארהב של DealTas – זה הזמן. תפתחו חשבון, קבלו כתובת בארהב ומרגע זה אתם במשחק! מפה זה פשוט. אתם מזמינים את המוצר, שולחים אותו למחסני DealTas, ברגע שהמוצר מגיע למחסני DealTas תקבלו הודעה לתשלום והשלמת התהליך – אתם נכנסים, מזינים את הקוד קופון, משלמים והמשלוח בדרך אליכם! במחיר מיוחד לחברי קבוצת ״כזה אני רוצה ! I Need It״ – רק 18 דולר עד הבית כולל הכל! כל העמלות וכל ההוצאות! ללא הפתעות! קוד קופון למבצע – ineeditalexasmall | במידה ותרצו 2 יחידות – תוספת של 5$ על היחידה הנוספת! 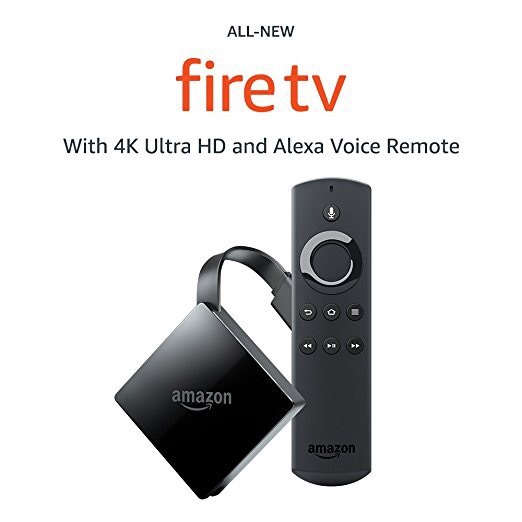 All-new, streamlined Fire TV with 4K Ultra HD, now at a better price and including HDR support. Includes HDMI output, micro USB for power or purchase optional Amazon Ethernet Adapter to take advantage of the speed and reliability of wired internet. Experience true-to-life picture quality and sound with access to vivid 4K Ultra HD up to 60 fps, HDR, and Dolby Atmos audio. Enjoy tens of thousands of channels, apps, and Alexa skills with access to over 500,000 movies and TV episodes from Netflix, Prime Video, YouTube, Hulu, HBO, SHOWTIME, STARZ, and more. Subscription fees may apply. Use your voice to easily find, launch, and control content with your Alexa Voice Remote or pair Fire TV with an Echo device for hands-free content control. Do more with Alexa by playing music, ordering a pizza, and controlling compatible lights and other smart home devices–just ask. Prime membership unlocks thousands of movies and TV episodes, including Thursday Night Football, Amazon Original Series, Amazon Channels, and ad-free listening to millions of songs with Prime Music. No cable or satellite? No problem. Watch live TV and sports through Fire TV with subscriptions to Hulu, PlayStation Vue, and Sling TV, or connect an HD antenna to your TV to get free broadcast networks like NBC and PBS. Simply plug into an HDTV and start streaming in minutes. With an ultra-fast processor and 802.11ac Wi-Fi, you can rely on smooth and responsive performance. Amazon Ethernet Adapter sold separately. The next generation of our bestselling Fire TV Stick. 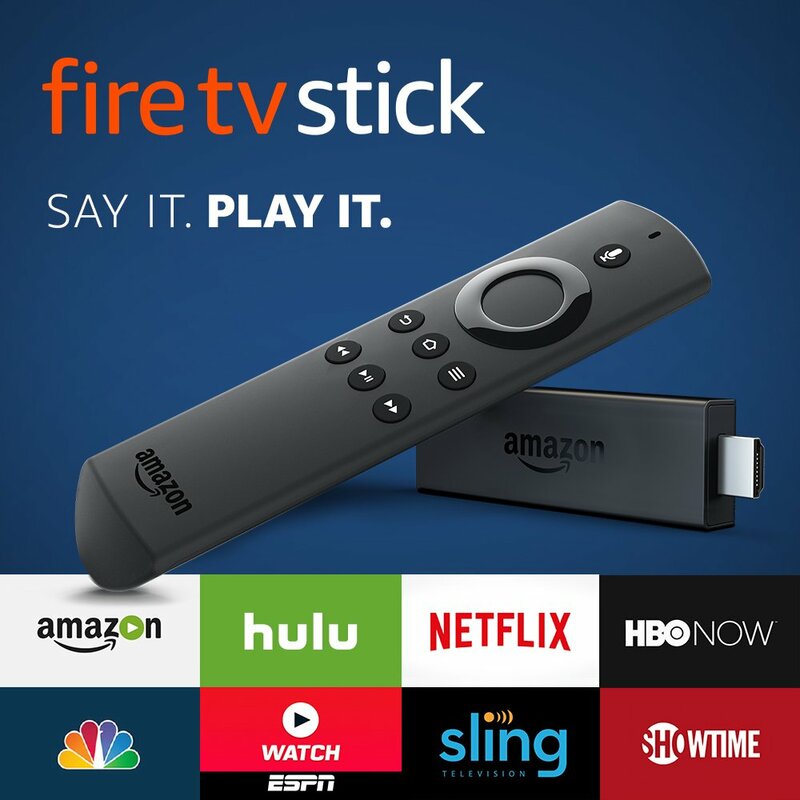 The most powerful streaming media stick under $50–now with the Alexa Voice Remote. Enjoy tens of thousands of channels, apps, and Alexa skills including Netflix, Hulu, HBO NOW, YouTube, Amazon Video, NBC, WatchESPN, Disney, and more. Subscription fees may apply. Launch and control content with the included Alexa Voice Remote. Simply say, "Play Game of Thrones" or "Launch Netflix" and Alexa will respond instantly. Plus, play music, find movie show times, order a pizza, and more–just ask. No cable or satellite? No problem. Watch the best of live TV and sports from AMC, HGTV, ESPN, FOX, and others with a subscription to DIRECTV NOW, or top-rated primetime shows with CBS All Access. Find the best way to watch with universal search results from over 190 channels and apps including Netflix, Hulu, and Amazon Video. Chromecast works with popular apps you like Netflix, YouTube, Google Play, Pandora, and thousands more. You can choose from over 200,000 movies and TV shows, 30 million songs, sports events, and games. See anything on your Android phone or tablet on your TV's larger screen, or use your laptop to cast any website from the Chrome browser. If it's online, you can cast it. 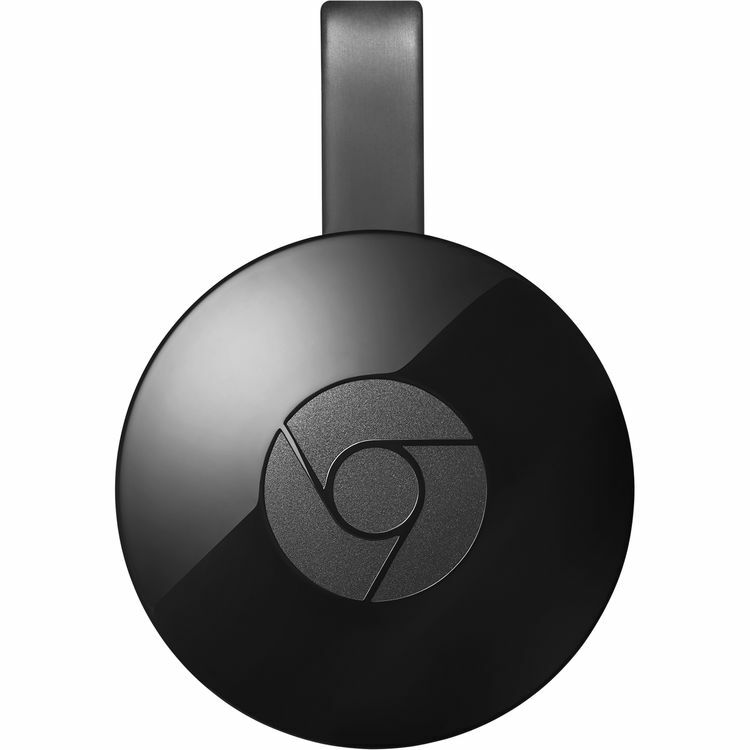 The Chromecast streaming media player is designed to keep video resolution high and buffering low thanks to integrated 2.4 and 5 GHz Wi-Fi support and a built-in adaptive antenna system. Because content is streamed straight from the cloud, movies and TV shows play without interruption, even if you and your phone leave the room. Built-in Google support allows you to easily cast content from Google Play Movies, Google Play Music, YouTube, and Chrome web browser. The Google Chromecast streaming media player works with the devices you already own. Plug it into the back of your HDTV, connect it to your Wi-Fi network, and start casting from your phone, tablet, or laptop. מחיר סהכ עד הבית כולל הכל – 38 דולר! ואם תזמינו 2 – זה יעלה לכם – 63 לזוג או… 31.5 ליחידה ! 4K UHD's high resolution enables improved clarity over 1080p Full HD while HDR provides deep, rich colors. Note: To view content in 4K or HDR, a 4K- or HDR-capable display and reliable broadband internet connection are also required. Chromecast Ultra works with popular apps you like Netflix, YouTube, Google Play, Pandora, and more, enabling you to choose your favorite movies, TV shows, songs, sporting events, and games. Note: 4K not available on all apps. Some apps require subscriptions. Chromecast Ultra is designed to keep video resolution high and buffering low thanks to integrated 2.4 and 5 GHz Wi-Fi support and a built-in 1×2 SIMO antenna system. Because content is streamed straight from the cloud, movies and TV shows play without interruption, even if you and your phone leave the room. 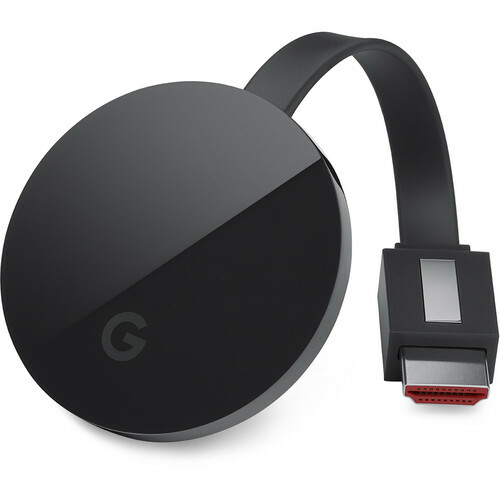 For users with slow Wi-Fi connections, Chromecast Ultra comes with a power adapter with an integrated Ethernet port, so you can plug directly into your home network. לאחר הרישום תקבלו כתובת אמריקאית. את הכתובת הזו יש להוסיף בכרטסת כתובות שלכם באמזון – פה – Your Addresses – Amazon . לאחר מכן – תבחרו לכם אחד מהמוצרים, תשלחו לכתובת החדשה שלכם בארהב. וכשהוא יגיע – תקבלו הודעה מסודרת – כנסו אליה, הזינו את הקוד קופון – ineeditalexasmall , בצעו תשלום על המשלוח (ועל המיסים עם יש) – וזהו! זה בדרך אליכם ! ללא עמלות נוספות, ללא הפתעות, ללא בקשות מוזרות… עד אליכם!